Founded in Brevard County, FL. in 1994, Citizens For Florida’s Waterways has been campaigning on behalf of boaters in Brevard County and around the State. We attend a significant percentage of and monitor all hearings and workshops, send representatives to Tallahassee, meet with boating interests in other parts of Florida, and continue to work toward organizing a Florida statewide boating coalition. We’ve written letters and columns in Florida Today newspaper, Florida Sportsman and Boat US magazines, have been interviewed for dozens of articles in several newspapers, and have been interviewed on-camera by several television news stations. When we introduce ourselves to someone new, they usually ask something along the line of “are you for boaters or manatees?” It’s a reasonable question because of the way the issue is commonly framed in the press, but the answer is simple: Citizens For Florida’s Waterways does not see this as an either/or answer. We exist to promote a reasonable coexistence between man AND the marine environment. We work to preserve the environment in a way that will allow us to enjoy it while assuring that our children and grandchildren will be able to enjoy it in the future. We pledged ourselves to pursue and promote good science, not politics, with respect to manatee management and to accept and follow the real science wherever it leads. Science has long ago established that the “crisis” of manatee extinction never existed and in most locations, regulating recreational boating was never required. Our board of directors includes members who spend many hours per week studying trends in manatee population, births, mortality and disease. That’s why we weren’t surprised when 3276 manatees were counted statewide in 2001, 40% more than the previous high count and six times the estimated population in 1972. In fact, we publicly predicted that record count months ahead of time and were asked by the Fish & Wildlife Conservation Commission how we could have known. We knew that the bitter cold that year would force most manatees to the warm water discharges, and the clear, calm weather would allow a good count. We studied the increases in natural manatee mortalities and other factors over the years and concluded a healthy population growth rate of over 5 percent. We also weren’t surprised by the lower count in 2002, hampered by warmer weather, or the record counts on the east coast in 2003. The fact that the recent count in 2015 that there are at least 6033 manatees residing in Florida is consistent with continued 5% growth in the manatee population. One of our associates studied the mystery of propeller wounds and derived a relationship between the spacing of those wounds and the sizes of boats that couldn’t have caused them. He further refined his model to show which way the vessel was traveling with respect to the animal, and the approximate size of the propeller. Whale researchers in Europe and dugong researchers in Australia are now applying his findings to their own work. In 2001, CFFW helped raise $45,000 to fund a study of underwater boat noise by the world’s foremost expert in manatee hearing, Dr. Edmund Gerstein. That study confirmed Dr. Gerstein’s long-held belief that manatees are unable to hear slow-moving boats until they are dangerously close, but can hear fast-moving boats while they are still at enough distance to let them avoid the boat. The use of Dr. Gerstein’s patented sound-producing device may one day make pervasive slow speed zones a thing of the past. Also in 2001, five members of CFFW filed an administrative challenge to stop the massive new slow speed zones passed by the Florida Fish & Wildlife Commission. Joined by attorneys from Standing Watch, the city of Cocoa Beach, the city of Titusville, and Sea Ray Boats, we showed how the Commission failed to follow their own rules when creating the new zones. Shortly after losing that challenge, CFFW raised $25,000 and hired a prestigious Tallahassee law firm to appeal the decision. Ultimately, the appellate court decided not to get involved in this contentious issue and issued a per- curiam decision upholding the state’s actions. 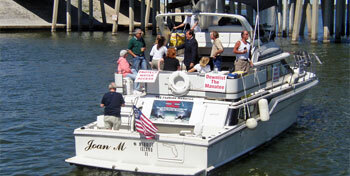 Many of our members and Board of Directors have served on various committees over the years, including the Brevard Marine Advisory Council, the Brevard County Manatee Protection Plan-Ad Hoc Committee, the Brevard Dredging Committee, the Comprehensive Maritime Management Master Plan, the Manatee Forum with FWC and USFWS, the Governor’s Boating Advisory Council and many more. CFFW brings continuous pressure on the state and federal agencies to listen to sound science and follow where that science leads. We have worked many years cultivating a relationship with the various agencies to ensure that the boater and waterfront property owner are represented and given a voice and a ‘seat at the table’ along side the other environmental advocates. CFFW has had a lobbyist in Tallahassee for several years working to represent our interests, introduce legislation and advise us on any legislative issues that we should be cognizant. Recently, we have consulted and supported efforts by Save Crystal River in Citrus County the Friends of Indian Rocks Beach, and the Pacific Legal Foundation in their efforts to resist unjustified regulation of Florida waterways. We continue to pursue efforts to quantify the effectiveness of boat speed zones for manatee protection, both collectively and individually. To date, effectiveness assessment has been completely biased since it has only been assessed by the same organizations that assumed effectiveness in the first place. We are also working diligently to understand the natural limits of the environment to support the ever-increasing manatee population. Until recently, scientists believed that warm water resources were the limiting factor to manatee population. The natural manatee food source, Submerged Aquatic Vegetation (SAV) or more commonly, seagrass, has recently been identified as the true limitation on the manatee population. Unfortunately, if the manatee population is ultimately limited by depleting the seagrass, we will have lost the health of the coastal estuaries. We are also working to eliminate the adverse affect of man-made warm water outflows on migration habits creating year-round vs seasonal grazing pressure on the seagrass from the increasing manatee population which ultimately will impact the sustainability of the submerged aquatic vegetation. We continue to grow our organization and work toward reasonable regulation of our waterways. We invite you to communicate with us, join our organization, or just attend one of our meetings.